paizo.com - Forums: Advice: Aliens too... alien? Hello everyone. So, long time fantasy player who's only lukewarm with sci-fi elements. However, once the campaign I'm running has finished, the next Game Master has urged us to play Starfinder. And, in a 'Flash Gordon' and 'A Princess of Mars' vein, I'm hoping to find a science-fantasy niche within the game to appreciate. Traditionally in our games (because of the few number of players) we all play two characters, and our game master is urging each of us to play AT LEAST one of the "alien" races. This is where I'm finding a stumbling block for inspiration, and I'm mostly musing out loud whether I'm alone in this. The Android? I can get behind them, whole heartedly. But all the other core alien races that aren't human... they feel... (as the subject line says) too alien. Their design, the write ups for them, they're too unlike anything I've ever played or wanted to play. Nothing catches my fancy. I can objectively understand them, but nothing grabs me as "cool" about them. Now, this isn't a new problem with me and sci-fi games. In times past, we've attempted Star Wars games where (aside from the fact that if you weren't the Jedi, you were a secondary character) an overwhelming amount of the non-human characters just felt too odd for me to relate enough to that I'd want to run them as a character. Since this is our first time playing Starfinder, I know our Game Master well enough he'd prefer us to stick with the introductory selection of races without dipping into the classic selections of elves, dwarves, halflings, etc. I'm just really wondering... am I alone in this challenge of finding an alien I'd want to play? Or are there others who just don't get into their aesthetics? And if so, how did you work around it? Have you looked through the alien archive and pact worlds races? They don't exactly get less alien... probably more, but maybe the variety will give you something you want to play? There are a lot of alien races that I wouldn't care to play, but there are also a lot that sound fun to me. Honestly, I’m the exact opposite. Playing a 2E AD&D game? Break out the Monstrous Humanoids book, daddy needs the closest thing to a Sasquatch he can find. Pathfinder? Don’t even talk to me unless I can use an Uncommon race. My Merfolk Monk needs a new pair of shoe-analogs. There are plenty of "Star Trek" aliens that aren't that hard to understand. Lashunta are basically space elves with antennae. Ryphorians are space elves who hang out with dragons. Damai are space elves in a Godzilla movie. Barathu are space elves who are amorphous floating gas bags. Drow are space elves, who are... well they're actually just space elves...with a cool twist! And even the more alien ones don't have to have alien motivations. Vesk are lizard men who are honorable warriors like Warcraft orcs or maybe D&D hobgoblins. Most Ysoki attitudes would fit in just fine with Firefly's scrappy underdogs. Shirren and kasatha are a little hard to get a handle on, but there's a reason they're the less popular races. Me? I have one Dwarf and that's probably the last "normal" race I'll use in Starfinder. Weirder is better. I have the opposite problem from you. I actually feel that almost all the races, in both Starfinder and Pathfinder, we're basically just too human. They were basically short stout humans, or really short humans with weird hair, or tall humans with pointy ears. They never felt really different for me. Same thing for most of the Starfinder races. They most feel like rubber-forehead aliens too me. My Game Master (since we're just starting out) would prefer we stick to those in the main book as it IS our introductory game. I actually have a fondness for the strange and odd myself... just... strange and odd in a different fashion. I put a bit more thought into it after I posted this, and I think it all has to come down to how it's presented. When it comes to sci-fi aesthetics, I'm more inclined towards the anime-esque stylism. Saturated colors, designs that are a bit more minimalism in detail or perhaps even slightly shiny. And a lot of sci-fi is aimed at those who like everything gritty, gray, and grim. If there were more that were... mammalian in nature, that would likely even help as well. But they're not. ◦ Android - Custom made to look a variety of ways, I can work with this. ◦ Human - I work in retail, so I'm not really fond of this species but in a pinch I can play them. ◦ Kasathas - Four armed Conehead. Meps, we are from France! ◦ Lashuntas - The description says they're attractive. The image is anything but. It feels like a bait and switch in an online dating site. ◦ Shirren - I know a cockroach when I see one. ◦ Vesk - Looks like Florida Man got lonely and hooked up with a gator. 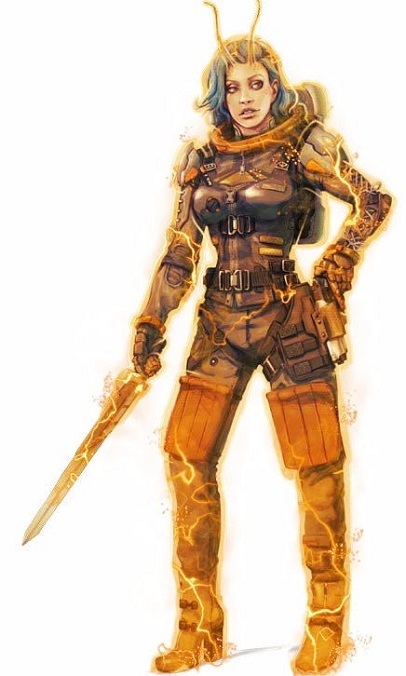 I've been looking around on Pinterest for some inspirations other people have used for Starfinder, and the BEST that I've found is people who've used Mantis from 'The Guardians of the Galaxy' movies as inspiration for a Lashuntas. My girlfriend is an artist-type... I might honestly share these pictures with her (since I like her art style) and see if she can't scrap together some inspirational images that are more of our aesthetic. Because this style might appeal to those already into this manner of sci-fi imagery... but for those who aren't, it's a bit of a deterrent. There’s a small series of books by David Weber and Steve White (In Death Ground, The Shiva Option, and one or two more) that are really excellent space opera types. In these books, they have the usual Bigger Than a Man, Looks Like a Cat alien. They make a point to discuss the fact that, even though they look like cats from earth, they’re as closely related to a cat as they are to a tree, or a fish. The point being, a Ysoki isn’t a Space Mouse. It’s a completely alien being that looks kind of like an earth (Golarian?) mouse. Not that I’m knocking anyone’s preferences or aesthetics. I don’t want to play as a mouse either. But instead of thinking of a Vesk as space lizard, I think of them as a biologically unknown creature, happens to look kind of like a big lizard man. And Joosh ‘Rick’ Justice, my Vesk soldier, will absolutely punch someone right in the brain parts for calling him a lizard. Lastly, alien talk aside ‘Looks like Florida Man got lonely and hooked up with a gator’ made me laugh entirely too hard at work. That's basically the character description of the pawn broker from Into the Unknown. I have a riot with that guy. I'll be honest, you would 100% find me getting blackout drunk with a half Florida Man, half gator guy. I bet there'd be some REAL adventures there. The kind where your friends see you without a shirt getting tazed by the cops on TV. I guess the thing is if you go in being dismissive of the options they will inevitably seem lacking. Some of the lashunta pictures in the book are gorgeous, some are squat and short. Lashuntas are a pretty good race for those who want something humanoid and similar to the legacy races. You get antennae, telepathy, and you can fit in anywhere humans do. Plus, you come in from a world that shares its planet with elves and gnomes. Or just go with the android if it speaks to you. Hopefully one of the options will be a good fit for what you want to do. Eh, my advice? Open it all up, half the fun of starfinder is playing weird races that aren't really unbalanced like playing monstrous races from dnd & pathfinder was. With two small exceptions from AA2, the orc is a 11 point buy resulting in 18 STR/18 anything but CHA, and the trox probably has a few too many abilities for what it is. Easy enough to house rule, a little too attractive compared to others if you don't. My players are a reptoid infiltrator mystic, a roswell gray technomancer, a dragonkin soldier, a sarcesian (space butterfly-mothman thing) operative, and a lashunta solarian. The variety of choice helps starfinder more than it hinders. If you like colorfull anime, Androids are the easiest race to play. In my opinion, the most anime-friendly race of the game. For the other races, I quite agree, they are not meant to be anime friendly. Vesk are Gorn from Star Trek :p Starfinder's version of Ratfolk/Ysoki are basically marvel's Rocket Raccoon as a race. Also, wait a sec did you just insult french? I appreciate the suggestions, everyone, thank you. Had a small talk with the game master, and he's planning on easing up a bit on some of the other races in Starfinder. He's just not very fond of how they're presented, as they're included in a book that if you're flipping through you can come across a few too many surprises regarding races... that won't be surprises if a player flips through the book and starts reading around trying to find a player character race. So, he's going to offer me a few optional selections that might suit my taste a bit more. 'Coneheads' (from 1993) actually was based off of an OLD 'Saturday Night Live' sketch from the 1970's. It was less about making fun of the French, and more playing up the the 1970's mindset that the French were foreign enough to most Americans that the eccentric behavior of the Coneheads was explained away as such. I'm actually of French descent myself. To be fair my druid left bat form for 10 seconds out of 6 levels to give a speech and was immediately surrounded by 15 invisible rogues trying to gank someone so.... two legs bad. If you GM is worried about you seeing the monsters that aren’t PC playable, you could just use archives of nethys and look through the races there then search for their images afterwards.